Get ready to drink, New York, because there’s a new bar putting all your pricey cocktail money towards charity. 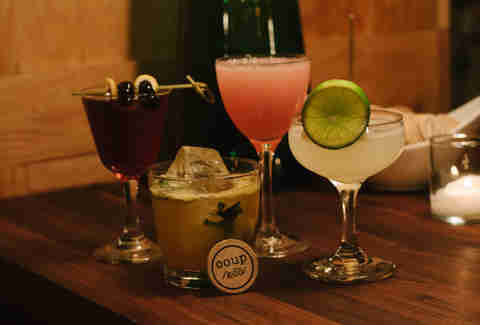 Coup, which opened last weekend, is the city’s first 100% not-for-profit cocktail bar. 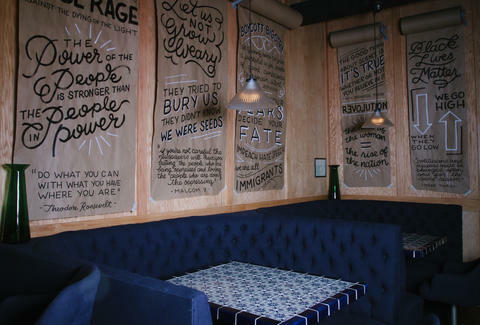 Founded by Ravi DeRossi, the brains behind some of the city’s most influential cocktail bars (like Death & Co. and Amor y Amargo) and bartenders Sother Teague and Max Green, Coup was founded in response to the policies of President Trump. The goal is to offer people a way to support causes threatened by the new administration, and to celebrate the diversity of New York. “The way we define ourselves is: we’re not an anti-Trump bar, we’re just a pro-charity bar and the charities we happen to be working with right now are organizations that need money right now to fight this current administration or are being defunded,” DeRossi tells Thrillist. After purchasing a drink, you’ll receive a wooden token that can be placed in one of several labeled jars representing different charities or organizations (including Planned Parenthood and the ACLU), allowing customers to determine exactly where their money will be donated. Coup also has a strict no tipping policy, helping more proceeds go to the cause. Tanner Saunders is an Editorial Production Assistant at Thrillist who will 100% drink for charity.